Are you familiar with the Practice of the Advent Wreath? It is a good way to remind ourselves of that hopeful longing for the Second coming of Our Lord! Much of the symbolism of Advent is associated with the Advent Wreath. The Advent wreath is typically a circular wreath made of evergreen branches with four candles: three purple and one pink (and some also prefer a white one, in the center). The evergreens used on the wreath symbolize hope and renewal. Because evergreens last so long without withering, they are a symbol for eternity, representing God who is unchanging. The circular shape of the wreath is also a symbol of eternity (Emmanuel: “God with us”) Decorations such as holly and ivy are sometimes used to signify the Passion and the pomegranate is used to symbolize the Church, (because of the countless seeds) and for the hope we place in the Resurrection. The candles together symbolize Jesus the “light of the world.” The first purple candle for week one is the prophet's candle and symbolizes hope. 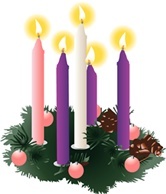 The second purple candle for week two is the Bethlehem candle. It represents Christ's manger and symbolizes love. The third week is represented by a pink candle which is the shepherd's candle, symbolizing joy. The last purple candle, for the fourth week is the Angel's candle symbolizing peace. The final while candle in the middle, is lit on Christmas Eve and symbolizes Christ who has come into the world to save us from our sins. Even the specific colors of the candles have meaning. The purple (violet) color is associated with repentance, a reminder to prepare internally for the Feast of Christmas, and is a color of royalty in anticipation of the birth of the King. Pink is used during the third Sunday of Advent representing joy and reminds us to rejoice in the birth of our Salvation. White is associated with purity and represents the sinlessness of Jesus. During this Advent season may we all come to a greater love and intimacy with Christ Our King, who came to earth as a Babe, born of Mary, to lead us all to salvation in His Name. In the Advent season, we also celebrate the Feast of St. Nicholas, (December 6th) A fourth-century Bishop of Myra (present day Turkey). He is a model for us of love and service to the poor. Our own Holy Father Pope Francis has given us a shining example of this “self-giving” to others. During this season when many concern themselves with the materialism and consumerism of the world, let us take another look and see in each and every person the image of Christ. What positive action can you take to imitate St. Nicholas? Advent is a time of renewal. A time to tune our hearts in silence to the great mystery of our salvation brought to us by Our Lord and Savior. A time to change, to convert our hearts, making ready for God's gift to us! As we contemplate what this means in our daily lives, let us take Mary as our example, and ponder with her these things in our hearts. Mary, the faithful handmaid of the Lord, acquired an attitude of “reverential hearing” (Pope Benedict) and this is portrayed by the beautiful icon of the Annunciation. Mary was in prayer contemplating the Scriptures when she was visited by the angel. “Full of grace,” he called her, the name given her by God! She is the humble handmaid of the Divine Word, who dwelt within her. During the first week of Advent, ponder the sacred scriptures and readings prescribed for Holy Mass. The scriptures remind us of a world lost in sin and darkness which awaits with hope and expectation the fulfillment of God's promise. He promised to send us His Light, His gift of Love. We all yearn for that light, we long for peace and trust that God will send us this gift. Our world is broken with sin and destruction, because man has forgotten the good that God wills for him. Our hearts grow weary because we do not stop to recharge ourselves. To live in the light of faith and hope in the coming of Our Saviour. Let us strive to use this season to grow in that faith and trust! A beautiful practice during Advent is to light a Mary candle. This candle is displayed in a candleholder with a sheer veil surrounding it tied with a ribbon. The candle is then burned before an icon of Mary, recalling to mind the words of Isiah “There shall come forth a rod out of the root of Jesse, and a flower shall rise up out of this root. “ This candle represents the Virgin who carried Christ, the Light of the World, in her womb. He has come to our world to dispel all darkness and sin. Echo with the psalmist, “Come Lord Jesus” come and be our Light and our Life. I hope, I wait for the fullness of Your presence, Lord, Come, Lord Jesus! During the Second week of Advent the readings at Mass of sacred scripture recalls to us the mission of St. John the Baptist. It is a message of repentance, making our hearts ready for the One who is coming. Pope Benedict, in his latest book, Jesus of Nazareth, the Infancy Narratives helps us with this meditation. The Second Vatican Council reminds us that we are a priestly people and we exercise this through corresponding to baptismal grace. “Each one ought to hallow Jesus in his heart,” wrote the Fathers, and bear witness to him through the goodness of our lives.” Let us contemplate how we can, like St. John the Baptist, point the way to Christ, leading others to His message and His love. Matthew represents the Magi not only as astronomers, but as “wise” men. “They represent the inner dynamic of religion toward self-transcendence, which involves a search for truth, a search for the true God...” (Pope Benedict, Infancy Narratives) The Holy Father goes on to tell us that these wise men represent a new beginning, the journey of humanity toward Christ, our Light. Gaudete in Domino semper: Rejoice in the Lord Always, again I say rejoice! On the Third Sunday of Advent, we light the pink candle on our advent wreath, and the liturgical color is “roman rose”. This symbolism is a reminder that Christ is our true joy. His coming upon earth to save us from our sins is our cause for rejoicing. God has favored His people and shown mercy upon them. Pope Benedict, in his book; Jesus of Nazareth, the Infancy Narratives, tells us that St. Luke indicates in his gospel readings that Our Lady was one of his sources, "His mother kept all these things in her heart." Only she could report the events of the Annunciation. The Angel greeted Mary with the Greek work for "Rejoice" (chaire). He was bringing "good tidings of great joy" Joy appears in these texts as "the particular gift of the Holy Spirit, the true gift of the Redeemer." This message of joy began with the salutation to Mary and continues through the life of the Church. It "immediately opens the door to the peoples of the world: the universality of the Christian message becomes evident." Did Mary realize at that moment the extent of this sublime mystery? We know that she pronounced her faithful "fiat" and continued to ponder these wonderful events in her heart. During this Advent season, like Mary, let us ponder this great gift of Our Heavenly Father, the Incarnate Christ, and make some resolutions to live our own calling more faithfully.